Chat heads were popularised by ParanoidAndroid in its hay day, and since then they’ve been accepted by some popular apps like Facebook Messenger. If you don’t know what Chat Heads are, they are small icons that linger on the edges of your display. They are used to quickly access a particular messenger window on top of any other app. It’s sort of like multi-window but only for your messages. Chat heads pop up on your screen, regardless of what you’re doing, and invite you to tap into the conversation. Chat heads allow you to view and reply to your messages from the current screen without needing to open Facebook Messenger. Chat heads not only increases the engagement rate but also allows you to message your contact without leaving the current App you’re using. While new Android updates allow you to reply directly from the Notification menu, Chat heads still remains useful as it doesn’t require latest Android versions as well as allows you to perform multiple operations at the same time. Now, having multiple messengers would crowd up your interface really quickly and that is where apps like DirectChat come in. DirectChat is an app that pulls all your latest incoming notifications to line them up on your chathead icons. 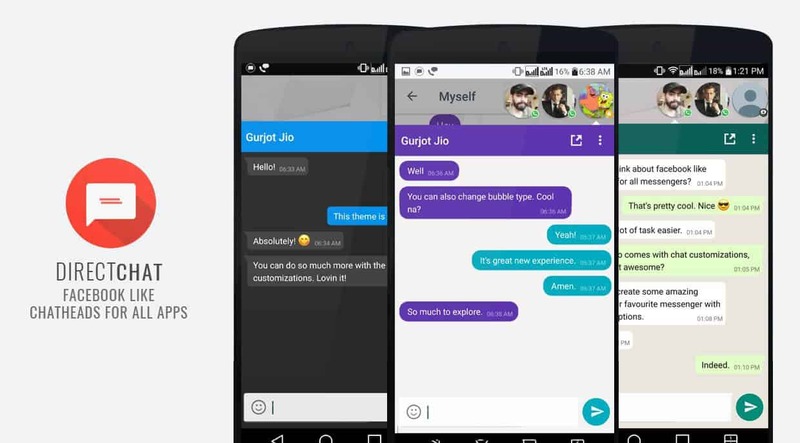 The app supports up to 14 instant chat apps and has a ton of customizations. 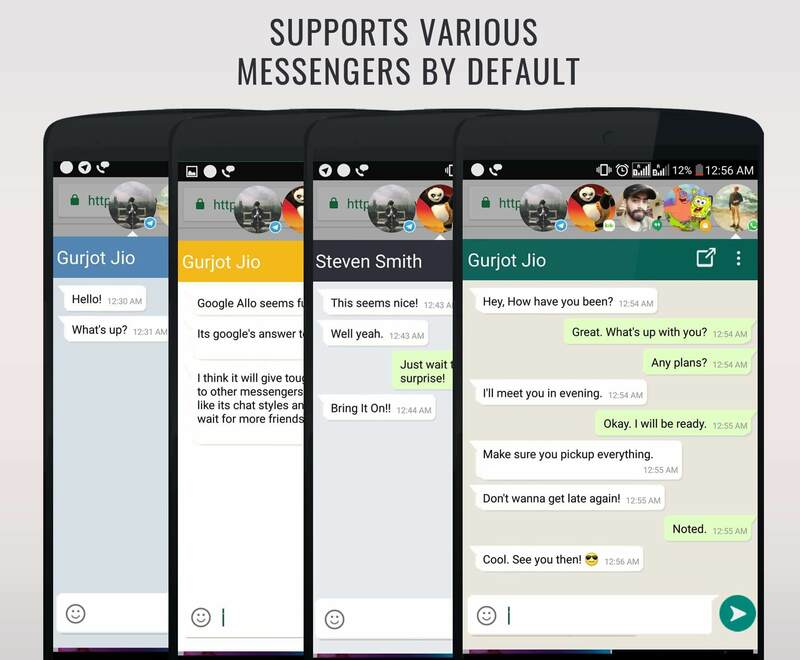 If you use multiple messengers, this app is definitely for you. You just can’t deny, switching between apps gets boring sometimes. If you’re in middle of a video & chatting with your friends, Chat heads could be your saviour. Direct Chat allows you to create Chat heads for WhatsApp, Google Allo, Hangouts, Telegram, Viber or any other Social messaging App. This would not only increase your response rate but allow you to carry out chats simultaneously in many messaging Apps. Step 1. Download the DirectChat App from Google Play Store. Step 2. Launch the App and enable both the options “Draw Overlay permissions” & “Enable Notifications”. Step 3. While enabling, you’ll be prompted with a Settings option window. 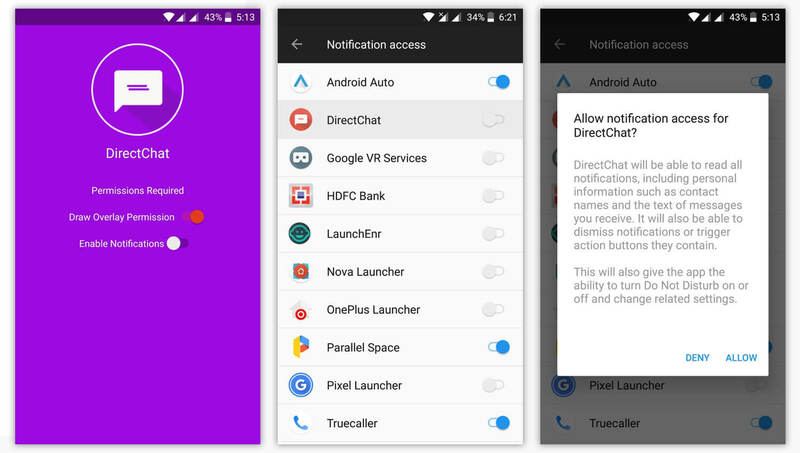 Find the DirectChat App and allow necessary permissions. Step 4. 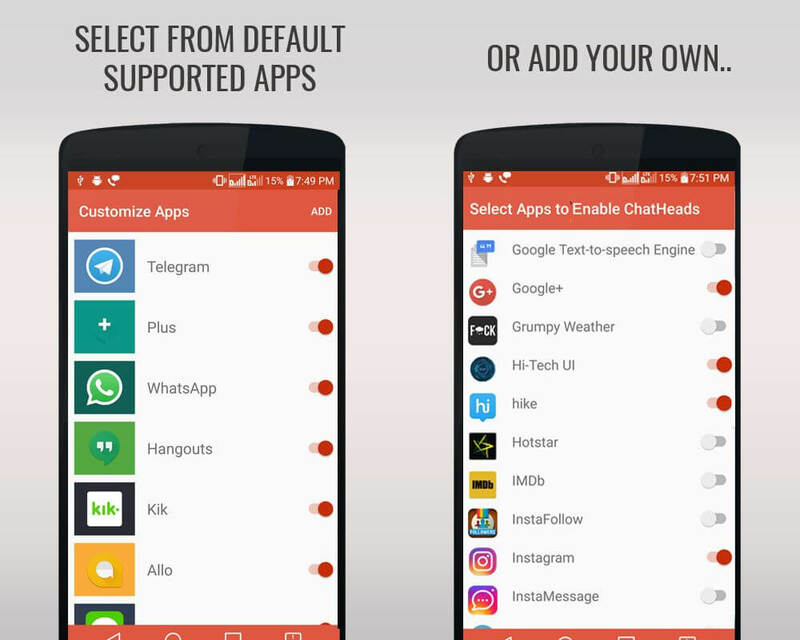 After granting all the permissions, open the app and click on “Apps” and enable Chat bubble for all the apps that you need. If you want to add any other Apps, click on “Add More” and select the apps from the list. The app is available on the Play Store and setting it up is really easy. Users will have to allow the app permission and draw over other Apps to notify them for it to work properly. 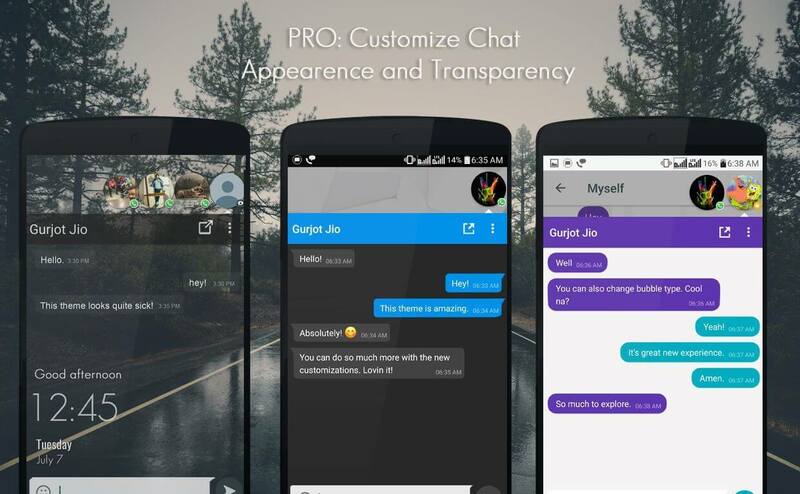 There is a Pro version which comes with No Ads, Instant Reply, Chat colours and many more features. The Pro version comes with a Rs 80 ($1.3) price tag. As we said earlier, there are tons of customization options too. Users can opt to preview the message without opening the chathead. There is an option to show the chat heads on the lock screen too. The chathead can itself be customized the way you want it to look. For example, you can increase and decrease the size of the chathead. Furthermore, there is a DND mode too checking which will stop the app from notifying users of new messages. Why the iPhone X would cost you lot more than it's actual price; iPhone X Insurance plans compared.